WeHo by the Numbers: When Are Car Crashes Most Likely in WeHo? 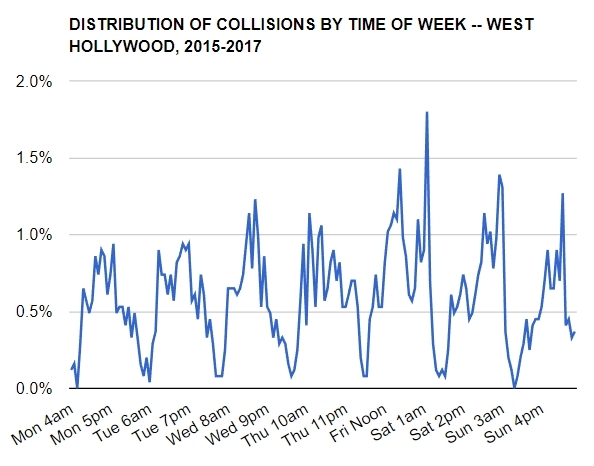 When it comes to traffic collisions in West Hollywood, no time of day or day of week is immune. 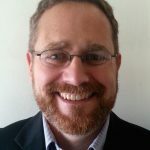 That is according to a new analysis by WeHo by the Numbers of data from the California Highway Patrol (CHP). The CHP gathers the data from local agencies such as the Los Angeles Sheriff’s Department. The analysis covers 2,600 traffic collisions reported in West Hollywood over the last three years. That works out to 2.4 collisions per day. It is an underestimate, because some collisions, particularly non-injury collisions, are never reported to the Sheriff. The number of reported collisions has declined in the past three years. There were over 1,000 in 2015, about 800 in 2016, and something more than 700 in 2017. The 2017 total, in particular, may rise as more reports reach the CHP. The severity of collisions ranges from fatal to property-damage-only (PDO). Together, fatal and severe-injury collisions represented 2% of collisions. The injuries were visible-but-not-severe in 6% of collisions. In 21%, someone complained of pain but there were no visible injuries. The remaining 71% of collisions were PDO. Based on three years of data, the months of June and October have the most collisions. December has the least. Friday — including the early morning hours of Saturday — is the biggest day for traffic collisions. An average of 2.8 collisions were reported each Friday over the three-year period. Saturday was in second place with 2.5 collisions per day. Monday had the fewest collisions: 2.1 per day. In percentage terms, 13% of accidents happened on Mondays and 17% on Fridays. Looking only at time of day, the collision peak is around 5 p.m. About 6% of collisions occur in that hour, as well as at 3 p.m. and 6 p.m. There are somewhat smaller peaks at 11 p.m. and 2 a.m. By comparison, fewer accidents happen in morning and lunchtime hours. The time-of-day pattern varies by day of week. The collisions associated with the afternoon commute happen Monday through Friday. The late-night collisions associated with nightlife occur on the weekend. Friday has both, so it has the highest number of collisions. The accompanying chart shows the number of collisions by hour throughout the week. Three of the peaks are at the end of Friday, Saturday, and Sunday nights. They are at 2 a.m. Saturday, 2 a.m. Sunday, and 11 p.m. Sunday. Another two peaks are during the afternoon commutes on Wednesday and Friday. Both are at 5 p.m..
To find out which times of day are riskier for the average driver, see the full report, When do traffic collisions happen in West Hollywood?